I have already made designs for all of these characters, but decided to give them a new coat of paint and assemble them all in one place. Wonder Woman gets an all-new design, Superman now has a contemporary logo, and the remaining get minor tweaks. The only way any of these are made available is if I do a Kickstarter to raise funds to procure an apparel license from DC Comics, so not very likely! Sorry. 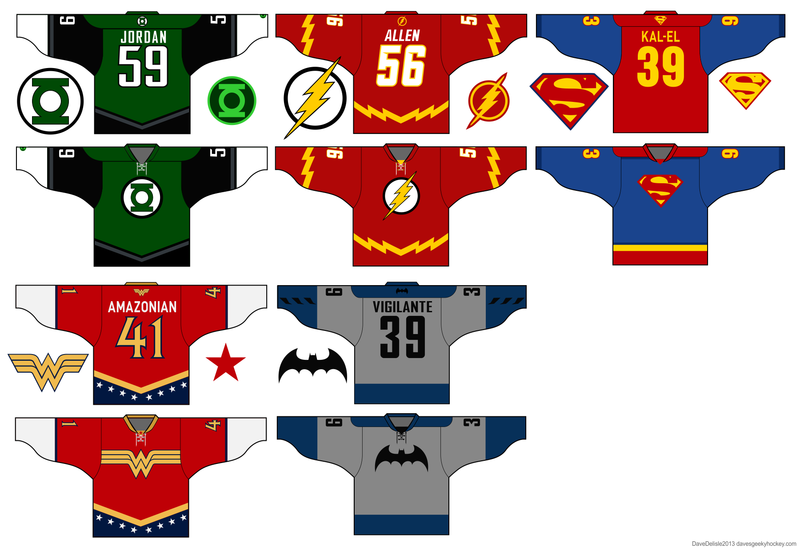 Posted on March 4, 2013, in Geeky Jerseys, Hockey Jersey Design and tagged Batman, Comics, Geeky Hockey Jerseys, Green Lantern, Hockey Jersey Design, Justice League, Superman, The Flash, Wonder Woman. Bookmark the permalink. 22 Comments. It would be interesting to know how much the license would be. I’m sure you might be able to get it but you might have to talk to the Rinkgear/GeekyJerseys people about the female cut style. These are my caffeinated thoughts as I am doing stream-of-thought this morning. I honestly suspect that Kickstarter would massively overfund. I know I’d get in it on it. Would Rinkgear due a private run of these? GL begs for manufacturing. Possibly. Need 12+, and you’d also have to buy the artist one (he’s such a diva). It’s suprising that something like these haven’t been made yet. I’m sure Kevin Smith would buy one of each himself! Say what you will though about fandom, I agree about the overfund comment. Websites like Superman Homepage and ComicsAlliance, I’m sure, would promote this stuff and help out. The problem is these comments about kickstarting something like this is a moot point. I’m sure Kickstarter or a offshoot can’t function in a way to precure an appeals license. That is completely different than something like creator-made projects. It’s one thing to make (or try to make) something if you own the property to- entirely different than licensing. I’m on on the Kickstarter. Robert is quite right. I was being a little glib about crowdfunding. While the support may be there, this is not what the Kickstarter platform was intended for. having daughters that play hockey, i think they’d love the Wonder woman jersey….no bracelets though? oooooh, lol, sorry. I was thinking you would have done something like the tv show, which i think repeated the red star motif and had raised bands on each edge….maybe 80stees will procure a license for these? I might have broached the subject with them already! Baby steps right now on all things DC. These are awesome. My daughters would be in for the WW jersey. You need to do the Flash Jersey with Cooper and number 3.14 to tie into the Sheldon Cooper character on the Big Bang Theory. You need to get CBS or TBS to pressure DC into licensing these. Please, please, PLEASE make these available. I would buy all of these. They are awesome! As I said above, these won’t be made available. Make a Gardner Green Lantern one and I’d sell my firstborn to DC just to make it happen.